Sens. Orrin Hatch, R-Utah, center, and Steve Daines, R-Mont., left, talk with reporters Sept. 7, 2017. Senate Republicans have a good chance of passing a repeal of the Affordable Care Act's individual mandate as part of their tax cut legislation, even though healthcare industry groups are lobbying hard against it, political observers say. That's because the three GOP senators who scuttled the last repeal-and-replace effort—Maine's Susan Collins, Alaska's Lisa Murkowski and Arizona's John McCain—are unlikely to balk at erasing the ACA's least popular feature, especially when the bill would not cut federal Medicaid funding to their states. "This is the closest Republicans will get to taking a pretty solid whack at the ACA, and I'd be surprised if it doesn't pass the Senate," said Lawrence Jacobs, an expert on healthcare politics at the University of Minnesota. "Those three Republicans are quite likely to sign onto this. Whether the House and Senate can resolve their differences and pass the entire tax package is another question." 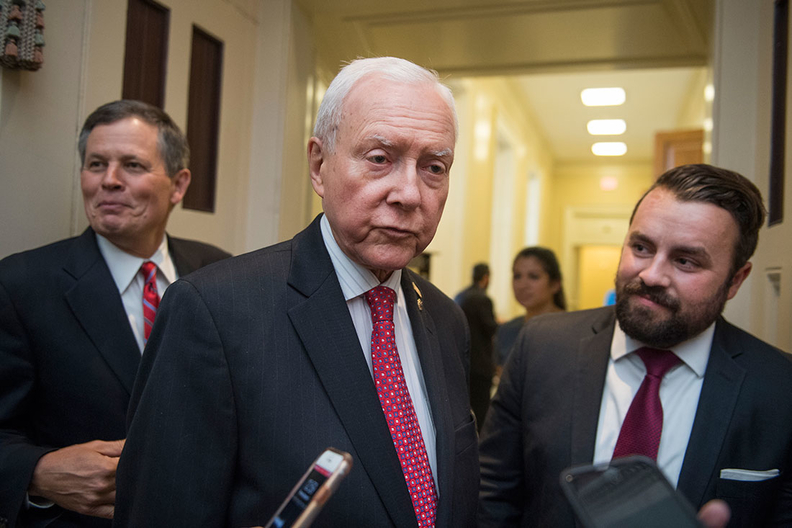 Senate Finance Committee Chairman Orrin Hatch (R-Utah) released a revised tax bill late Tuesday that includes repeal of the ACA's tax penalty on people who don't obtain health insurance. Including the mandate repeal will help Republicans make larger cuts in corporate and individual rates without exceeding their self-imposed cap of increasing the federal deficit by $1.5 trillion over 10 years. Ironically, passage of a tax bill repealing the individual mandate could reduce the chances of Republicans passing a broader ACA repeal-and-replace bill in the future, political observers say. "Including repeal of the mandate in the tax bill certainly takes the wind out of the sails in terms of support from conservatives," said Christopher Condeluci, a Republican healthcare lobbyist and former Senate staffer. "And you lose a lot of the budget savings you could otherwise use to pay for new tax credits for insurance. That will have a substantial impact on any forthcoming repeal-and-replace exercise." House Republican leaders are expected to hold a floor vote Thursday on their version of the Tax Cut and Jobs Act, which does not include repeal of the mandate. House GOP leaders say they are open to including it if it can pass the Senate, which is expected to vote on the tax cut bill after Thanksgiving. Repealing the mandate would give Republicans an estimated $338 billion in cost savings over 10 years to cut tax rates more and ease the rollback of popular personal tax deductions like the home mortgage interest deduction, according to the Congressional Budget Office. It would produce $185 billion in reduced federal spending on premium subsidies for exchange enrollees and $179 billion in savings on Medicaid. President Donald Trump has urged congressional Republicans to include repealing the mandate in the tax bill because it would kill two birds with one stone—abolishing a cornerstone of Obamacare and giving Republicans more leeway in cutting taxes. But abolishing the mandate would result in 13 million fewer Americans with health insurance in 2027, according to the CBO. That includes an enrollment reduction of 5 million in Medicaid, 5 million in individual-market insurance, and 3 million in employer plans. In addition, average premiums in the individual market would increase 10% more annually than if the mandate were preserved. The coverage losses would occur, the CBO said, because healthier people would be less likely to buy insurance without the law's tax penalty for not being covered and because the premium increases arising from the sicker enrolled population would lead fewer people to buy. The Medicaid coverage losses would occur because many low-income people would be less likely to seek coverage without the threat of the mandate's tax penalty, even though their low income exempts them from the penalty, said Robin Rudowitz, associate director of the Kaiser Family Foundation's program on Medicaid and the uninsured. "Outreach and marketing and understanding about the mandate definitely contributed to increased Medicaid enrollment," she said. "Without the mandate, future enrollment likely will not be as high, particularly for healthy individuals." Healthcare providers are nervous about the proposed mandate repeal. "As a result, we'd see uninsured individuals having a health crisis or needing substance abuse services coming into the system without coverage," said Paula Bussard, chief strategy officer at the Hospital and Healthsystem Association of Pennsylvania. "That would increase uncompensated care and put greater pressure on providers already serving low-income people or people with complex medical needs." Six major healthcare trade groups urged congressional GOP leaders Tuesday to preserve the ACA's individual mandate. They included the American Academy of Family Physicians, American Hospital Association, the American Medical Association, America's Health Insurance Plans, the Blue Cross and Blue Shield Association and the Federation of American Hospitals. "Repealing the individual mandate without a workable alternative will reduce enrollment, further destabilizing an already fragile individual and small group health insurance market on which more than 10 million Americans rely," the groups wrote. Of the three Senate Republicans who previously voted no on repealing the ACA, only Collins has publicly voiced reservations about eliminating the mandate penalty. "My concern is that if we combine the healthcare issues with tax reform, we make it far more controversial," she told Politico. In contrast, McCain said it wouldn't be a deal breaker for him, though he wants the tax bill to pass through regular order. Senate Majority Leader Mitch McConnell (R-Ky.) is moving to pass the bill through the expedited budget reconciliation process, which would prevent a Democratic filibuster. Few if any Democrats are expected to vote for it. Passing the bill on a purely partisan basis runs against McCain's exhortation to seek bipartisan support. Condeluci predicted Murkowski and McCain would vote for the tax bill with the mandate repeal because it wouldn't reduce Medicaid funding, and the CBO projected that it wouldn't destabilize the individual insurance markets. "I think the tax benefits that will flow from tax reform will get them to yes," he said. In contrast, he thinks Collins will be more inclined to vote no on the tax bill because the mandate repeal is included. Losing only Collins would still give McConnell enough votes from the Senate's 52 Republicans to pass the bill. Jacobs, who generally supports the ACA, said even if Republicans repeal the mandate as part of the tax bill, Democrats and ACA supporters should see this as a larger victory. That's because it would represent a concession by Republicans that the broader structure of the ACA likely will remain in place. "They will be implicitly accepting that Obamacare is the foundation of America's healthcare system," he said. "And when Democrats return to power at some point, there will be plenty for them to come back and rebuild." Correction: An earlier version of this article miscalculated how many fewer people would be in employer plans if the ACA mandate is repealed. The error has been corrected.